Wondering if your newly bought gamepad can be used to both playing games and controlling a robot? The new BLE 4.0 wireless gamepad V2.0 produced by DFROBOT can meet all your requirements. Based on TI CC2540 Bluetooth chip design, it is specially designed for DIY players and does not need programming. This gamepad is using hardware scanning structure, high respond speed and supports one keyboard toggle between central and peripheral roles. Under central device mode, it can be connected to any DFRobot BLE device and achieve remote control. While under peripheral device mode, the gamepad can be used as a HID keyboard-mouse device for a computer. This product also supports multi-buttons recognition, each button has pressed and released stage, which is more friendly for remote control. Based on the previous version, V2.0 not only improved on hardware, but also made connection more stable. In addition, AT function is added to this version so users can change basic settings like turn on/off shaking function using AT commands. This gamepad also supports KISS connection—now you can connect it to any device just by putting them next to each other. During data transferring, the RX light will always be ON. Note: if there isn't any connection and button pressed down, the RX LED will be OFF until you press any buttons. During data transferring, the MODE light will always be ON. KISS Connection: The gamepad can establish the connection once it is close to the target (<10cm), like a kiss. After the first connection, the gamepad will change its connection setting to unique and will only connect to the current device in the future until customers unbind them. AT Command Setting: You can use AT command to config the bluetooth parameter, same to Bluno AT command. 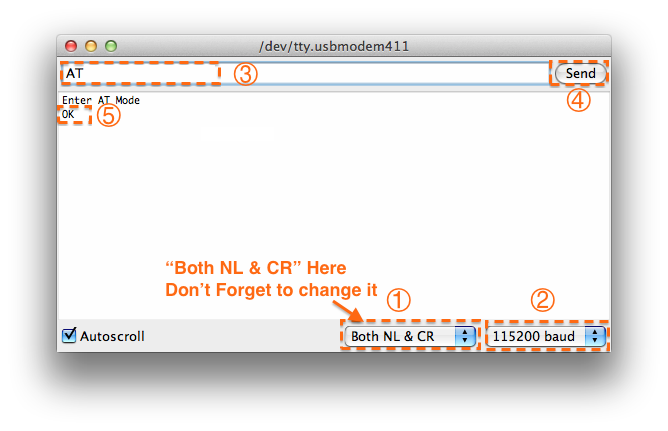 "AT+CMODE=UNIQUE" to change the connection setting to unique and '"AT+BIND=XXXXXXXX" to manually write the unique MAC address that needs to be paired. 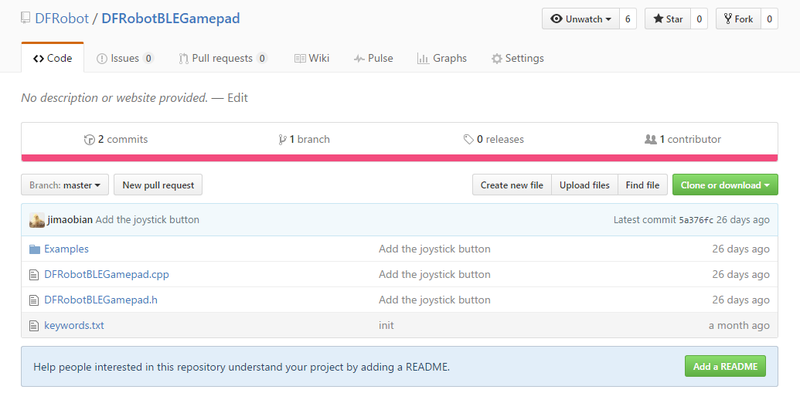 Then after restarting the gamepad, it should be able to connect to the target device automatically. One-keyboard unbind: press "ANALOG" button to unbind MAC address and change the connection mode. AT commands: Change Bluetooth setting through serial AT commands, "AT+CMODE=ANYONE" to change the connection mode to "ANYONE". Then you can unbind the devices after restart the gamepad. HID is the abbreviation of the "Human Interface Device". In brief, it is similar to your PC keyboard and mouse, you can play game with these device. Just select the HID mode, and connect to your PC bluetooth. done! If you like play video game, you can't miss it! Note: We've tested Win7/8 with CSR Bluetooth dongle. In this section, we use DFRobot Bluno with gamepad as an example. Set Bluno as the peripheral device, upload the code to the Bluno, put the gamepad and the Bluno together (<10cm), so it will setup KISS connection. Open the serial port of Bluno and change to HEX display (Arduino IDE doesn't support! Please use the third part Serial assistant) then you can check the output data. 6.Reserved bytes: reserved for future developed functions, default "0x00"
When any button is pressed, the command byte will become 01 and send corresponding data. 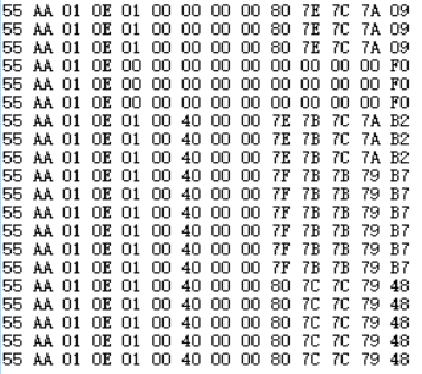 When nothing is pressed, the command byte will become 00, which looks like this: "55 AA 01 0E 00 00 00 00 00 00 00 00 00 F0". The 14 digital buttons takes 2 bytes in the whole array. First byte outputs two push buttons on the joystick and 4 buttons on the front, the second byte represents 8 number buttons. 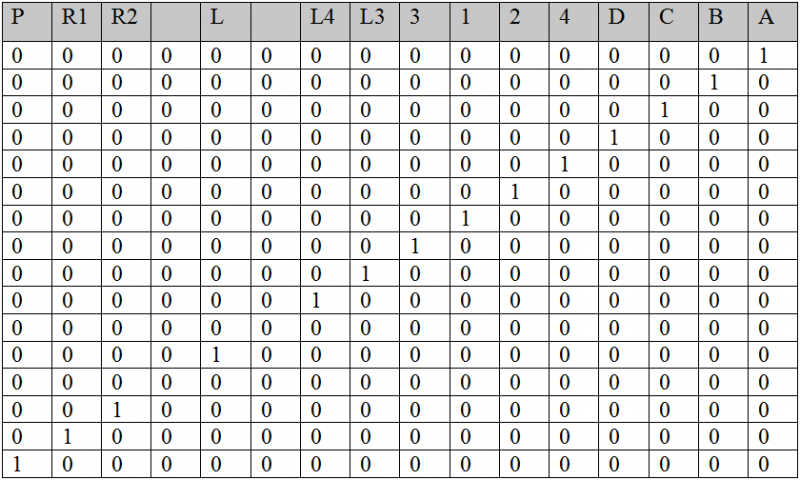 — If you press “A” ，the value from the truth table is "0000 0000 0000 0001" and the output is “00 01"
— If you press “L” ，the value from the truth table is “0000 1000 0000 0000" and the output is “08 00"
— If you press "A" and "4" ，the value from the truth table is "0000 0000 0001 0001" ，and the output is "00 11"
— If you press "1"，"2"，"3"，the value from the truth table is "0000 0000 1110 0000" ，and the output is "00 C0"
— If you press "1"，"2"，"3" and "A"，the value from the truth table is "0000 0000 1110 0001"，and the output is "00 C1"
Notice: Due to hardware scan problem, R2, R1 and right joystick push button cannot be pressed at the same time, otherwise the gamepad will stop sending data. Analog Buttons has 4 bytes in all, represents two joystick X&Y-axis data. Notice: When the joystick is at the middle, it should output “0x7F”. But in case of mechanical vibration, we expand the range to be considered as “middle” value, like from 0x7C to 0x7F. Now have everything clear about the gamepad? Now let us do something interest. 6. If the BLE is successfully configured , you will receive "OK"（⑤） from it. 7. If received "ERROR CMD" instead, try sending it again or you should check whether the command is correct or not. 7. "AT+TXPOWER" Change the Transmitted Power which will change the signal range. 7. Click the upload button and wait 2 minutes. Shopping from BLE Wireless Gamepad V2 or DFRobot Distributor.